We do 7 day walking tours and also weekend tours. Here is a selection of the walks we do. They will take place in the highlands and headlands of north Donegal, including the landmark mountain Muckish and the magnificent coastal walk along the Fanad Peninsula. The walks range from easy – 3 to 4 hours over a reasonably flat surface such as Ards Forest Park – to medium difficult such as Knockalla Mountain and Muckish which involve steep inclines and uneven, soft and boggy surfaces. Ards Forest Park is probably the most beautiful and certainly the most varied of Ireland’s forest parks. With its 481 hectares there is a wide diversity of habitat including broad-leaved and evergreen woodlands, salt marsh, sand dunes and seashore, freshwater lakes, fenland and rock faces. Depending on the weather a picnic on the beach with a refreshing swim or ‘dip’ beforehand! 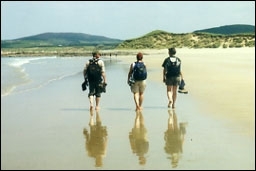 Our longest walk – about 6 hours – takes us along the coast of the Fanad Peninsula – here we traverse sandy beaches, grass dunes and rock sculpted by the Atlantic waves. 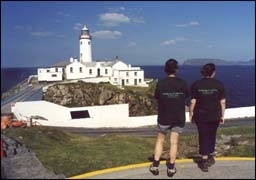 We finish at the Fanad Lighthouse which watches over the entrance to Lough Swilly and the turbulent Atlantic. 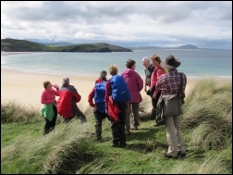 A shorter coastal walk is on Horn Head, a peninsula on Sheephaven Bay. 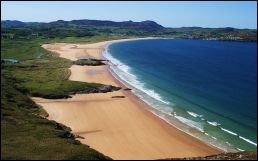 Golden beaches, rock blow holes and views to Tory Island and the Donegal Highlands make this walk very special. The walk from Knockalla Mountain has breathtaking views of the North Fanad Peninsula with Mulroy Bay, Lough Swilly and the Atlantic below us. As we near the end of our walk we look down on Ballymastocker Bay whose beach was voted the second most beautiful in the world by British travel writers – we can cool our feet there or even have a swim when we descend. This walk takes about 4 hours and includes steep inclines and sometimes boggy surface. Ascent 350 metres. We’ll also visit Glenveagh National Park , a beautiful wilderness of mountains and lakes, where we’ll walk through a steep-sided valley along Lough Veagh. Exotic and beautiful gardens are located beside the castle which tell of a fascinating and troubled past. Tea and scones at the castle tearooms add to the pleasure of the day. 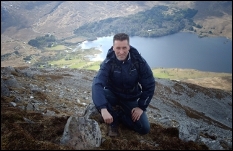 We may also make an ascent of Errigal, the monarch of the north-west and Donegal’s highest mountain at 752 metres. Rising in splendid isolation from Dunlewy Lough its quartzite pyramidal form and its steep screes which glow snow white in the summer light make an arresting sight. The walk is steep with an ascent of around 500 metres and a walking time of 3 hours. You will be rewarded with views over mountains, lakes and sea. For a rainy day ( it sometimes happens ) a visit to the medieval walled city of Derry is also in the programme.